A couple of months ago I invited a bunch of friends, clients and colleagues to a webinar on the wonders of snail mail (I’m serious). Today I’m sharing that recording with you. For the past two+ years I’ve been using snail mail (I’m serious) as a significant part of my overall marketing. In this one-hour webinar, I’ll show you exactly how I do it. I’ve found that using snail mail to stay in touch with people is effective as a marketing tool. It’s so retro that it feels cutting edge – nobody gets “real mail” anymore and so when your card arrives along with all the junk they otherwise receive, people notice. For the last two years I’ve used a service called Send Out Cards which allows me to send snail mail – both one-off cards and group broadcasts – from my computer. It’s very cost-effective and very automatable (unless there is no such word). 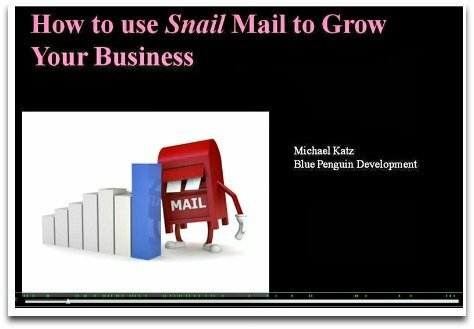 I use snail mail in four primary ways, each of which I explain on the webinar. Also, I’m joined on the call by Jordan Adler from Send Out Cards. After I share how I’m using Send Out Cards in my own business, Jordan talks about the company itself and explains how to sign up for anyone who’s interested. Here’s the link, click to watch it right now and let me know what you think (I’m serious).